Great images Images by Sander van der Borch , Full gallery Here. 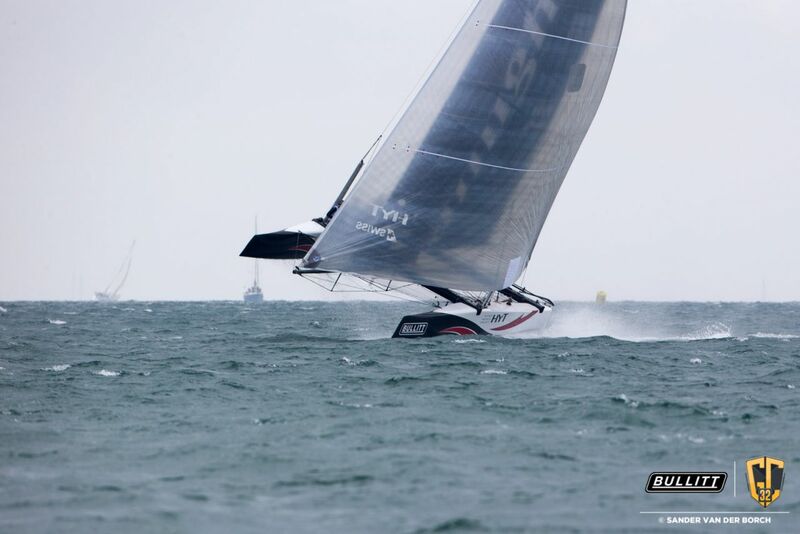 :- Extreme nowadays is foiling in the breeze, and that is what the GC32 Fleet is doing. 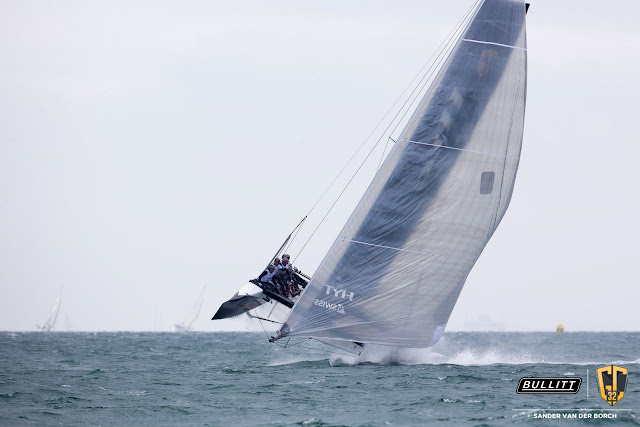 With the X40s being retired next year the former 'Extreme Series' will try update the show to what the GC32s are offering. Can´t wait to see their new boat. 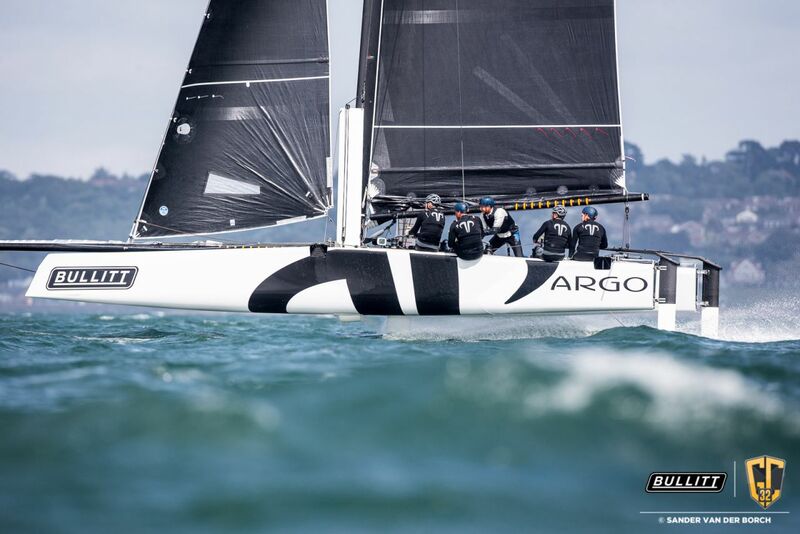 The pinnacle of this new foiling breed is going to be the Turbo AC45s, today New Zealand went out with theirs, and Sander van der Borch captured a shot of them while shooting the GC Tour. 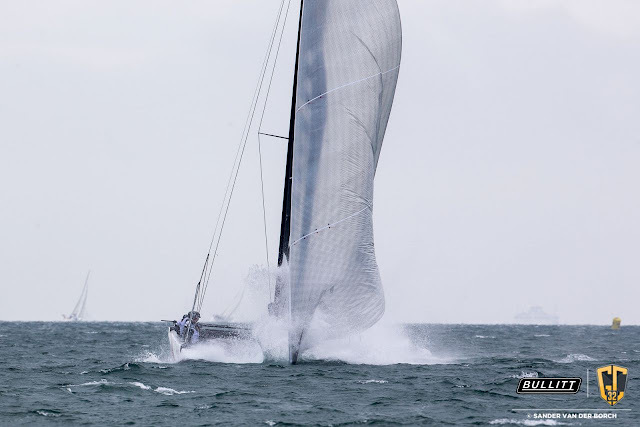 Westerly breeze pumping in at 20 knots and a lively sea on the Western Solent brought racing alive for the final day of competition at the Bullitt GC32 Racing Tour’s Cowes Cup. In the conditions, the five GC32s were able to foil not only on the downwind legs, but occasionally upwind too. Blasting off down the reaching leg after the starts and on to the runs, boat speeds on the one design flying machines at times reached the high 30s. Most teams had hair-raising moments, the boats either launching or burying if they unintentionally came off their foils. However the Martin Fischer-designed catamarans looked after their crews and, despite the lively conditions, there were no un-toward incidents. While the racing was close over the first two days of competition, today ARMIN STROM Sailing Team was the form boat. 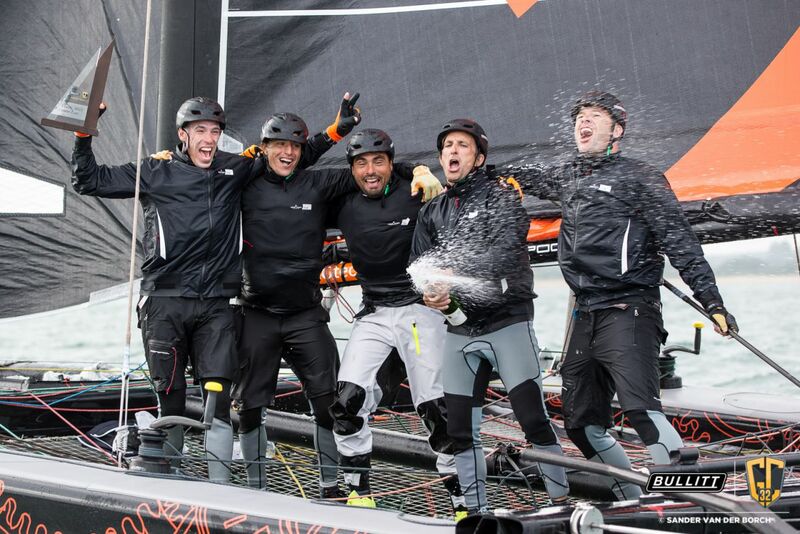 Swiss Olympic Star sailor Flavio Marazzi and his crew relished the big conditions, winning four of today’s five races, causing ARMIN STROM Sailing Team to win the Bullitt GC32 Cowes Cup by nine points. “It was very nice - much more fun than sailing in under five knots!” observed Marazzi, who has also won windy GC32 regattas in Marseille and Key West. In his role as GC32 Class President, Marazzi was pleased with the Cowes Cup, the second stage of the inaugural Bullitt GC32 Racing Tour. 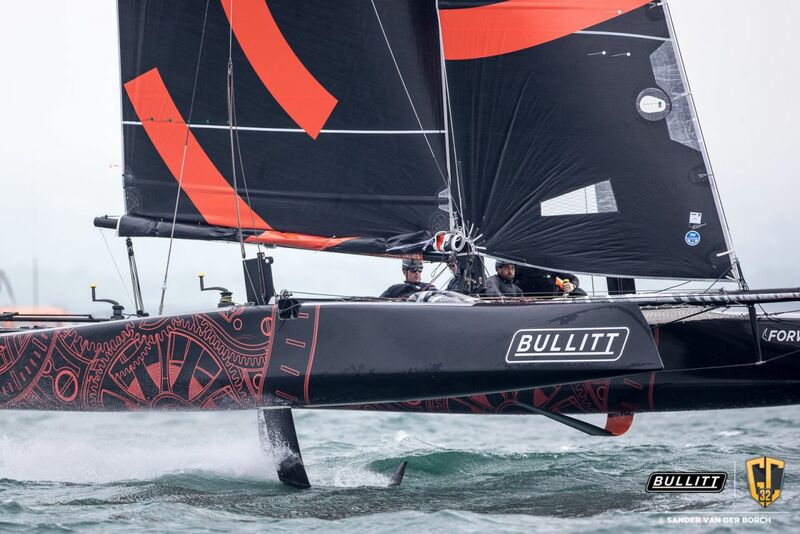 “The owners had fun on the water in perfect conditions and the hospitality boat was always full of guests.” The event was the first time corporate guests in the UK, including those from the GC32 circuit’s Reading-based sponsor Bullitt Group, were able to experience first hand what it is like to race on a state of the art catamaran, similar to those used in the America’s Cup, that foil and can sail at nearly 40 knots. Sultanate of Oman relinquished its grip on the regatta’s lead today partly due to skipper Leigh McMillan breaking his hand in yesterday’s final race. Taking his place today was another two time Extreme Sailing Series winner, Paul Campbell-James, currently with the Ben Ainslie Racing America’s Cup challenge. ‘C-J’ approached the GC32 as if it were an AC45 and attempted to sail the smaller one design foiling catamaran in the big conditions without a gennaker. “It was a bit frustrating for us,” admitted mainsheet trimmer Peter Greenhalgh. 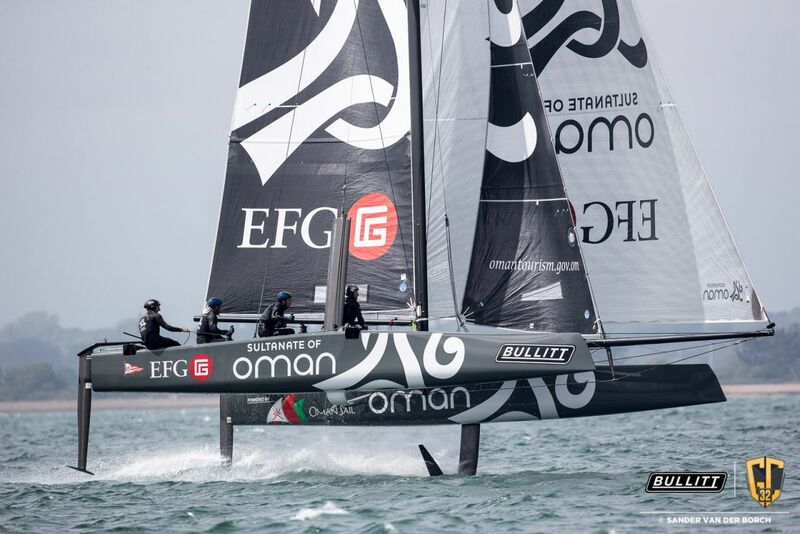 “To make that work you had to go really quick, which is fairly brutal on the crew…and it is not as stable without the kite.” Sultanate of Oman at one point hit 36 knots. For the third race the gennaker was being used again, but it wasn’t properly set up and in the third race Sultanate of Oman had been comfortably leading when, as Greenhalgh put it, they were “annihilated’ after they furled the large downwind sail prematurely, dropping them to fourth. By the last race, they had lost touch with ARMIN STROM Sailing Team and a problem with a winch forced them to retire. 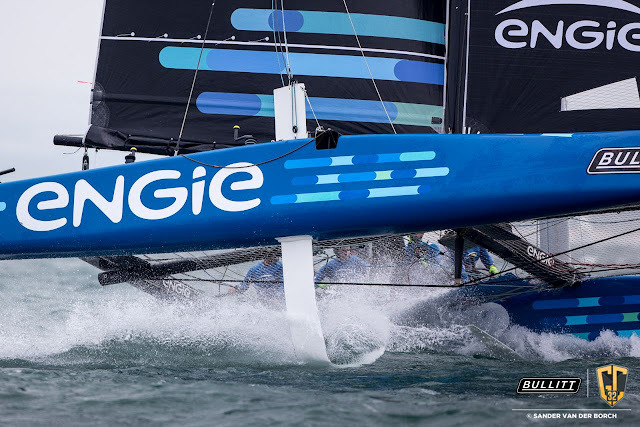 Going into the final race all that was left to be decided was the final spot on the podium with Ernesto Bertarelli’s Alinghi and Seb Rogues’ ENGIE tied on points. Ultimately the two time America’s Cup winner prevailed, Bertarelli stepping ashore still pumped from a vigorous day on the water. Nonetheless Rogues was pleased with his team’s performance. “It was really good fun. The conditions were strong and it was the first time for me to do a race in that sort of wind. I was happy because we didn’t capsize!” The Frenchman only transferring to the GC32 class from the shorthanded offshore Class40 monohull in September and he still considers himself a multihull newbie. 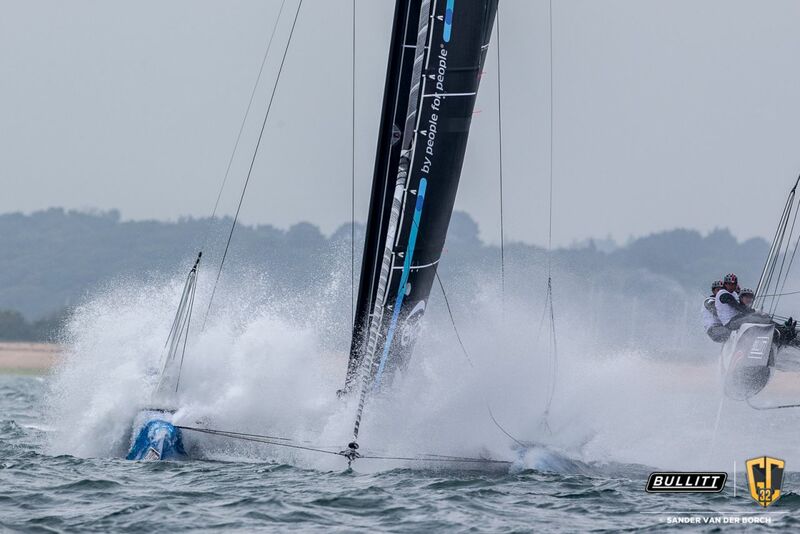 “These aren’t cruising catamarans - it is a crazy horse!” he declared of the GC32s. Conditions took their toll on ENGIE today with some minor breakages such as the outhaul on the mainsail that caused them to be slow out of the start on one race. “And when something like that happens in this class – you lose! But I am happy because the team progressed well and quickly,” Rogues concluded. 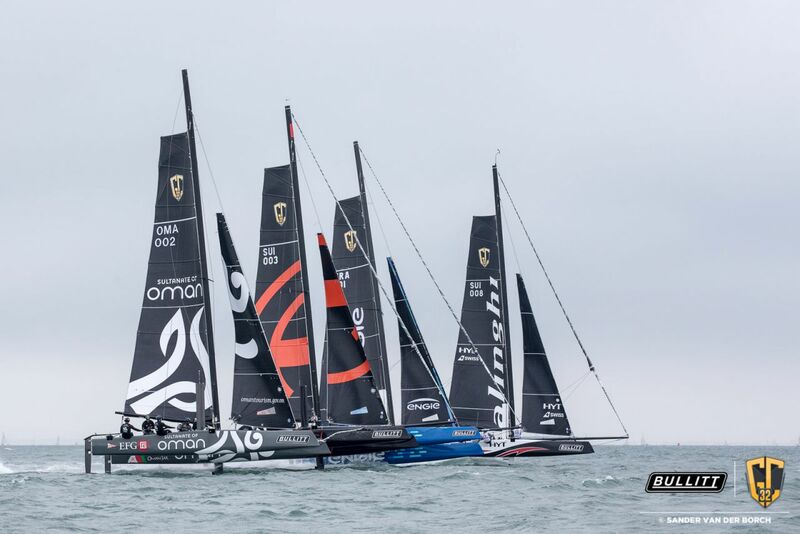 In theory the GC32s are more than capable of sailing faster than the 17.41 knot average for the record Ben Ainslie Racing set in the 2013 Round the Island Race with time of 2 hour 52 minutes and 15 seconds, but they will be up against two trimarans, one French, one English, both around twice the GC32’s size. As Rogues puts it – it will be a fascinating clash of the titans. For all the results please click here.